The 94th most acclaimed album of all time wants to rock your gypsy soul, just like way back in the days of old. Sail into the mystic with Van Morrison’s 1970 breakthrough album. Fantabulous! Mendelsohn: Van the Man is back. How long has it been since we talked about Astral Weeks? Seems like forever ago. Last time around, as you may recall, I wasn't a fan of Van's sad-sack pining and we ended in a bit of a stalemate. This time, though, I think things will be a little different. Moondance is a different monster, Klinger, and I'm not ashamed to simply tell you that I love this record. Even when we descend into the pit of pining that is "Crazy Love", I remain undeterred in my adoration because "Crazy Love" is achingly beautiful without being a complete downer. 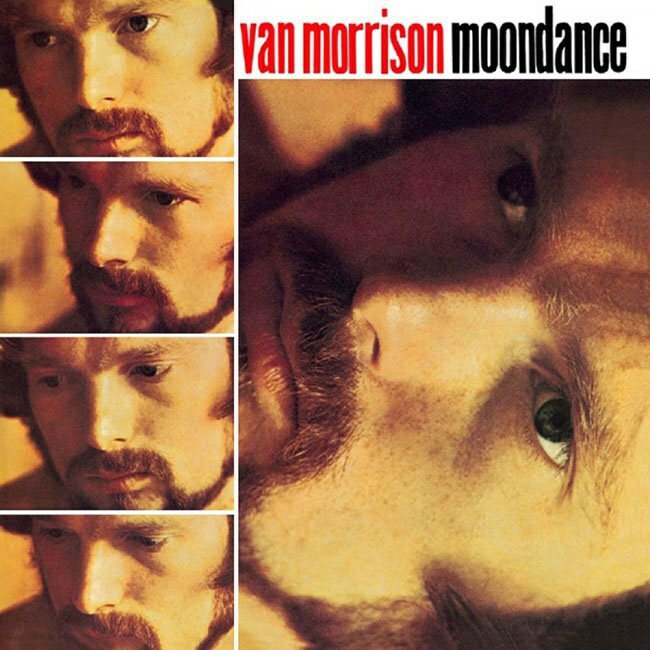 I find Moondance to be so much more well-rounded than Astral Weeks, so much more fun to listen to. I know we have other things to talk about and I know we aren't supposed to compare an artist's output against itself, but I can't help but feeling that the Great List got this one wrong and Moondance should have been in the Top 20 instead of Astral Weeks. Care to take the bait? Klinger: If by "take the bait" you mean go dig out Astral Weeks and lose myself once again in a reverie of nostalgia and loss, then yeah—bait taken. And yes, it's still comes across to me as a stunning evocation of longing for a time and place that you've long since walked away from. But like you said, that's not why we're here. The math doesn't lie, and the critical consensus of Great List has chosen Van's magnum opus artistic statement over his far more accessible follow-up. Also “Crazy Love” strikes me a happy song, largely pine-free. In a sense, though, it's almost irrelevant, as the two albums are so distinct they almost sound as if they've come from different artists. The only constant is Morrison's voice. It's more directly focused here, delivering a more precise blast of R&B energy, but he still wails himself into another consciousness in places ("Into the Mystic" being my favorite example). But overall the tone is considerably lighter, with many songs—most of side two, for instance—sounding as if they were written just for the sheer joy of performance. I take it that it's the brighter feel that's captured your imagination this time around, Mendelsohn? Mendelsohn: Yes, I like the brightness of this record. Also, I wasn't a big fan of the flute on Van's last record—a major downfall on the record for me, nearly as bad as his nonstop pining. And while we get treated to a bit of flute on Moondance, it is in tolerable amounts that don't make me want to shove the instrument down the flutist's throat. That in itself would be enough, but Van seems to be on top of every part of his game, blowing out this album with succinct shots of rock and jazz and healthy doses of R&B. The poetics of his last outing have also been toned down, leaving a svelte body of work that we could leave rightly alone or go digging through the double meanings in search of an artist's soul and true intent. Moondance seems to have it all, at least all of the things that I love. But you are right that the Van Morrison of Moondance seems worlds away from the Van Morrison of Astral Weeks. What strikes me as the biggest difference is Van's move away from the folk template and stream-of-consciousness lyrics into a more rock-driven arena with sharper storytelling and touches of Americana a la the Band. Do you think this record's placement suffers because the Band did it first and arguably better? Or am I reading too far into Van Morrison's musical sidestep of the folk community? Klinger: No, I don't think it has much to do with that—the late 1960s “back to roots” movement came from a lot of places, but it is interesting that you mention the Band. Morrison was among those who made a pilgrimage to the Band's wooded musical shire there in upstate New York, where he drank heartily of brown liquors and collaborated on "4% Pantomime" (which would appear on the Band's Cahoots album a year after Moondance). Morrison was clearly tapped into the zeitgeist, regardless of chronology. What I really hear going on here is part of the dichotomy that has always been there in Van Morrison's sound—this swinging back and forth between the mystical and the earthy. It happens musically, and here the pendulum has clearly swung toward much punchier sounds of songs like "Glad Tidings", and it happens lyrically (throughout his career, Van has alternated between composing poetic ruminations about a mythical lost Caledonia and grumbling that he can't get the phone to work). He's a dewy-eyed romantic and a cranky curmudgeon—sometimes within the same song. I think he finally got his musical pendulum centered not too long after this, with 1972’s masterful Saint Dominic’s Preview, which teeters beautifully between the blissed-out R&B punch of “Jackie Wilson Said” and the mystical musings of “Listen to the Lion”. Here, though, it's all about the joy and wonder, and you know that can’t be bad. Mendelsohn: That's the one thing I will never understand but the Great List—sadness and loneliness always seem to trump joy and wonder. I feel sorry for those poor, sad rock critics who no one seems to love. Conversely, I want to grab them by the scruffs and shake the mope out of them while shouting, "You got dumped because of your poor hygiene. Take a shower and get back out there!" None of that applies to this record, though. Van Morrison's focus centers squarely on the revelry of life and love. It is beyond refreshing. Normally I'd be hitting the wall right now as Van's proclamations of joy start turn slightly treacle, but it hasn't happened yet and I don't see it happening in the foreseeable future. I can't get enough of "Crazy Love"—Van Morrison's use of falsetto and the backing singers fills my blackened, cracked heart with light and I can't help but smile. That's the way it goes with this whole album. I can't find fault with it and ultimately, that just makes me angry to think that it has been relegated to the back end of the Top 100 (which, in the grand scheme of things, is probably pretty good—still, I'd like to see it higher). Can you point any weak spots, Klinger? Normally I'm all over those like a kid picking a scab, but I'm not coming up with anything this time. Maybe I just don't want to find anything wrong with this record. Klinger: Well, I reckon that the song "Moondance" has lost a touch of its luster through years of overplaying—especially, inexplicably around St. Patrick's Day. I mean, I know Morrison is from Ireland and all but that song is about as Irish as a bowl of Lucky Charms. Of course, I did play the crap out of this disc when I first got it, so I willingly share some of the blame. And because the songs on Moondance are so tightly constructed and so full of relatively simple chord changes and verse-chorus-verse structures, it's easy to take it for granted. In fact, I hadn't listened to this album all the way through in years, figuring I had pretty well internalized it. So it was refreshing to hear it with your thrill of discovery in mind. It made me dig in a little more when I was listening, and when I did I realized just how effective Morrison was here at arranging the songs to give them just enough space to allow the various components to take on a life of their own. Live, he would expand upon the twisty turns in songs like, say, "Caravan", drawing them out in even more unexpected ways. I would refer you to his 1974 concert disc It's Too Late to Stop Now as proof of his masterful ability to extrapolate his ideas into longer forms without ever meandering into mere jamming. But it's pretty clear that even in the more conventional studio takes heard here that he has a vision in his head. Mendelsohn: And it's a great vision at that, although after spending so much time with this album, I finally found something about this album to dislike—the five-second harpsichord intro to "Everyone". But it only annoys me until the rest of the tracks kick in, at which point it stops being so annoying and seems to melt beautifully into the background. I don't even mind the flute solo. So while Van Morrison gives the various components of each track enough room to breathe, he crafts them in such a way that there is no question about their ability to work seamlessly together. I don't know which one is tougher. But with Van, it all seems so easy. The great ones always make it look like a piece of cake, don't they?